So I love making pies and tarts....and really anything mini is just too damn adorable. 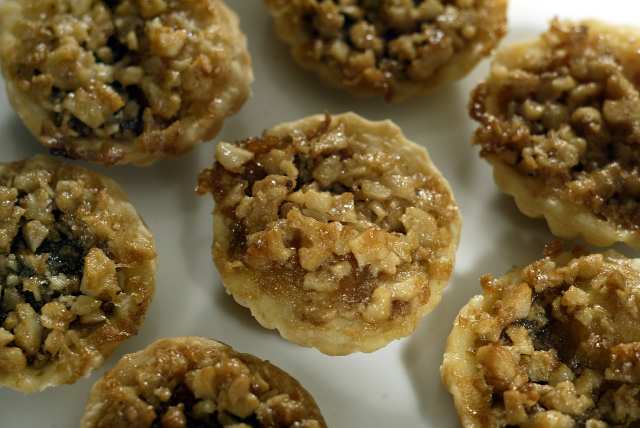 So when I saw these Butter Tarts in the LA Times I fell in love. This past Thanksgiving I revised a Butter Pie and turned it into a Brown Sugar Tart...these are extremely similar in ingredients and I'm sure either recipe could be altered, merged or adapted to the other. Note: Make the filling while the dough chills. 2. Combine the milk and egg and add to the flour mixture. Pulse 5 times, then process until the dough forms into a large ball. (If you do this by hand, make a well in the middle of the flour, add the egg and milk and use a wooden spoon to combine, then knead until smooth.) Wrap the pastry in a cloth or plastic wrap and chill for at least 2 hours. 3. Roll out the dough on a lightly floured board to a one-eighth inch thickness and cut out rounds with a 2 1/4 -inch round biscuit cutter. Use scraps to form another ball, roll out again, and cut out more rounds. 4. Push a round into a 2 1/4 -inch tart tin, pressing it gently into the bottom and corners. Repeat with the remaining dough, working in batches if necessary. Makes about 40 (2 1/4 -inch) tart shells. 1. Heat the oven to 400 degrees. In the bowl of an electric mixer, mix the butter, sugar, maple syrup, eggs, salt, vinegar and vanilla. Stir in the walnuts. Stir the filling again as needed if it separates. 2. Spoon a scant 1 tablespoon of filling into each unbaked tart shell. Reduce the oven temperature to 375 degrees and bake the tarts for approximately 15 to 17 minutes.